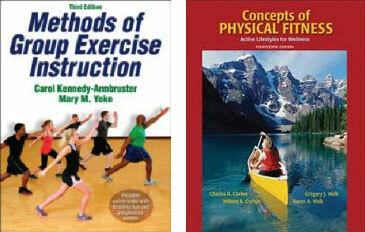 Methods of Group Exercise Instruction, Third Edition, moves from theory to practice in a logical progression. Rather than simply providing routines, this book helps instructors develop the core skills needed for creating routines, use proper cueing, and adapt their teaching to new modalities. Teaching techniques convey appropriate training for each muscle group and methods for warm-up, cardiorespiratory training, muscular conditioning, neuromotor training, and flexibility. In addition, starter routines, modification strategies, and instructor assessment criteria are presented for seven class formats: kickboxing, step training, stationary indoor cycling, sport conditioning and boot camp, water exercise, yoga, and mat-based Pilates. The text also touches on alternative modalities, including dance-based classes, fusion, and mind–body training. To supplement your text book, W.I.T.S. has compiled an additional resource from McGraw Hill Publisher. This supplemental reading includes content from Concepts of Physical Fitness: Active Lifestyles for Wellness 16th Edition by Corbin,Welk.